If you're learning the Spanish language, chances are you've already experienced the attraction of the Hispanic culture and are looking for more! They say that everyone loves their home, whether they were born there or not. This is the feeling that sometimes results from travel to Spanish-speaking countries. Visit once and you're likely to return. Travel for a moment with us on this page. Do Hispanics in the U.S. Speak Spanish? What is the Catalan language? Have You Had a Calimocho? Netflix announced in March 2019 that it had acquired the rights to make a series based on the well known novel One Hundred Years of Solitude by Nobel Prize winner Gabriel García Márquez of Colombia. The author died in 2014. His son Rodrigo Garcia indicated in a prepared statement, "For decades our father was reluctant to sell the film rights to ‘Cien Años de Soledad’ because he believed that it could not be made under the time constraints of a feature film, or that producing it in a language other than Spanish would not do it justice." 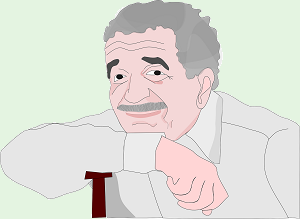 The family felt that the quality of modern productions in the series format and the international viewership and acceptance of productions in various languages meant that the production could be done in a form that García Márquez would have supported. The Netflix series will consist of 10 parts, be produced in Spanish and be filmed mostly in Colombia. Two of García Márquez’s sons will serve as executive producers. The novel was first published in 1967 and has been translated into 46 languages and sold about 50 million copies. The Netflix series will consist of 10 parts and will be filmed mostly in Colombia. One Hundred Years of Solitude uses magical realism to tell the story of seven generations (100 years) of the Buendía family in the mythical town of Macondo. Whether or not you are studying Spanish, you should watch the movie Roma. 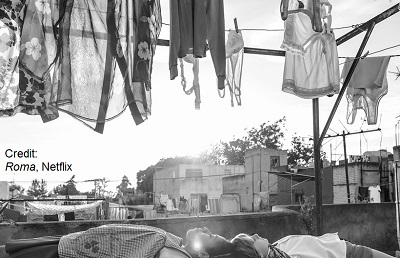 Set in Mexico City's Roma district in the early 1970s, Roma chronicles the life of a middle-class family and its live-in maid (played by Yalitza Aparicio). Through a myriad of intimate yet subtle details that carry more meaning than may be initially apparent, the movie speaks volumes about life, class and cultural differences. Indeed, a second viewing may be required to pick up on everything. Many of our students have asked to talk about it as part of their class. Roma won the following awards at the 2019 Oscars: Best Director, Best Cinematography, and Foreign Language Film. Nominated for seven other awards as well, many had expected the movie to also win the Best Picture Award. At the British Academy Film Awards, it did win Best Picture. 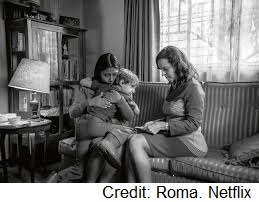 Released late in 2018 with a limited theatrical run, Roma is available via streaming on Netflix. The dialogue is in Spanish with some Mixtec (an indigenous language), and subtitles are available in English and Spanish. Click the YouTube play button below to see the movie trailer. On March 8, Yalitza spoke on gender equality at the International Labour Organization (ILO) headquarters in Geneva, Switzerland. The ILO is a United Nations agency whose mandate is to advance social justice and promote decent work by setting international labor standards. She said that if you are women facing obstacles, you have to “keep insisting because at some point you will achieve it!” ("Si eres mujer, y si dicen que no, …sigue insistiendo porque en algún momento lo vas a lograr"). Have you ever wondered about why Hispanic names are sometimes quite long, often including two or more surnames (last names)? As you study the Spanish language and culture, you have no doubt encountered examples. The historical tradition is for a child's first surname to be the father's first surname (apellido paterno), with the second surname being the mother's first surname (apellido materno). That's the case with Spanish actress Penélope Cruz Sánchez. 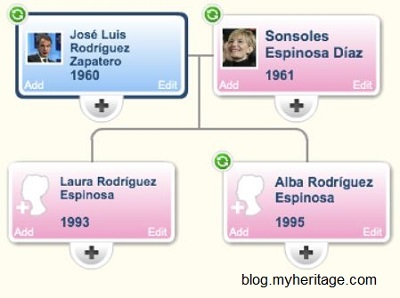 Her father's first surname is Cruz and her mother's first surname is Sánchez. She likely uses this full name for legal matters but we know her as Penélope Cruz or perhaps Señora Cruz. As is the case here, it's a common practice today to use only one surname. Composite first names are also common in the Hispanic culture; for example, Juan Pablo. If you have travelled in Argentina, Chile, Colombia, Venezuela, Spain or a handful of other Latin American countries, chances are you have eaten empanadas. We say this because they are super popular, much like pizza is in the U.S. According to Wikipedia, "An empanada is a type of pasty baked or fried in many countries of the Americas and in Spain. The name comes from the Spanish verb empanar, meaning to wrap or coat in bread." They originated in the northwest region of Spain, Galicia. It is hard to describe an empanada in more detail because their size, shape, dough, fillings and even cooking methods vary by country and region. Fillings include seafood, meat, cheese, vegetables or fruit, so there are some great choices for both veggie and meat lovers. In Argentina and Chile, a common filling consists of ground beef with pieces of hardboiled egg, onions and olives or raisins. A great meatless option is made with spinach and cheese. And the list goes on. 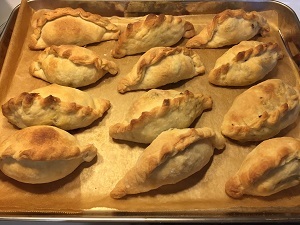 A great way to try empanadas is to visit one of the countries where there are popular, but authentic empanadas can be found in the U.S., including in Vermont (check online). You can also try making your own at home. 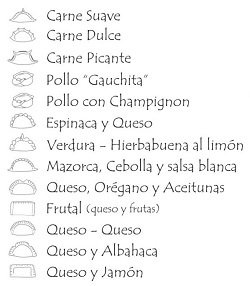 In countries where they eat empanadas frequently, it is common to purchase a package of the discs (discos) of dough. That eliminates the work of preparing the dough. Here is a summary of how to make empanadas. More details can easily be found online. The dough is rolled out until thin and then cut out into round discs, roughly 5 inches in diameter. The filling is prepared, including cooking depending on the ingredients. This is sometimes done prior to dough preparation. The filling in placed in the disc, the disc is folded in half and the edge crimped closed. 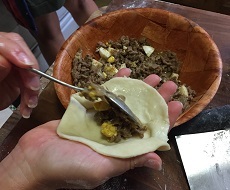 There are various artistic ways to do the crimp, and the process is called el repulgue de empanadas. The Spanish verb repulgar in this context means to crimp. This 1-min YouTube video shows one way to crimp an empanada. Because it is common in many Latin American countries to buy empanadas 'to take out' (para llevar), the stores fold the empanadas in different ways for the different fillings and give you a little graphic, like that shown at left, so you'll know which is which. This may be an unexpected question, and perhaps the answer is as well. The U.S. population consists of about 2% Native Americans; the rest are immigrants and descendents of immigrants. Hispanics in the U.S. hail from about 20 different countries, but they share a common linguistic and cultural heritage. And, language is a big part of one's cultural identity. So, do U.S. Hispanics speak Spanish? Do they think that's it's important that their children speak Spanish? Is it necessary to speak Spanish to be considered Latino? The answers to these questions are not simple. Hispanic immigrants that spoke Spanish prior to immigrating obviously spoke Spanish. However, speaking Spanish is still stigmatized by some in this country. Hence it is not surprising that Hispanics learn English and speak it in public, reserving Spanish for the home. Children have often been encouraged to do the same. Most foreign born Hispanic immigrants speak Spanish to their children. Some kids learn the language while others are unreceptive. They are growing up in a country where almost everyone speaks English, and that's what they want to do. And then what happens when they have kids of their own? Take a look at the graph on the right, produced by the Pew Research Center and based on a 2015 National Survey of Latinos. The results show that almost all foreign born Hispanics speak Spanish to their kids, but the percentage doing so drops off considerably with each generation. The Pew Center goes on the say that in 2006, 78% of Latinos spoke Spanish at home; the number dropped to 73% in 2015. While nearly all Latino adults said it was important that the next generation speak Spanish, only 28% believe it's necessary to speak Spanish to be considered Latino. Clearly some parts of the U.S. have sizeable Latino populations while others such as Vermont are in the <1% category. The numbers cited above vary by region, as do opinions among Hispanics. In some places it seems like everyone is speaking Spanish. Where will we be after 10 more years? 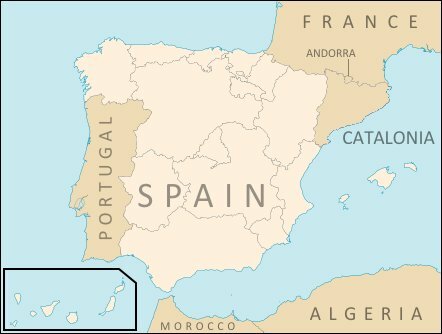 If On October 1, 2017 an independence referendum was held in Catalonia, a largely independent community located in the most northeast corner of Spain. While Catalonia is part of Spain, it has its own history, culture and language. The Catalan independence movement has been all over the news, so we are taking this opportunity to say a few words about Catalan. It's one of the official languages in Catalonia and something visitors to Barcelona run across. What is the difference between Catalan and Spanish? Catalan is not a dialect of Spanish. While they share some vocabulary, grammatical structure, and expressions, they are separate languages. Some say Catalan sounds like a mix of French, Italian and Spanish, perhaps more like the first two. All are Romance languages sharing a common derivation from Latin, and are similar but distinct. If you speak Spanish, you should be able to understand a Catalan speaker. If you don't have the time or inclination to make sangria, you may want to try a calimocho, a summer-season drink made simply with equal parts of red wine and Coke and served over ice with a slice of lemon. Don't worry, it's not a sin to mix wine and Coke, as long as you use inexpensive wine. Some people react negatively to the idea of this mix, but the flavors really do work well together and make a refreshing drink. You can also substitute lemon-lime soda in place of Coke for a “tinto de verano,” which translated literally means “summer red wine” in Spanish. Even though it's a popular drink in Spain, it is for some reason nearly unheard of in the U.S. So if you've never had a calimocho, give it a try this summer. Chances are you've heard the hit song Despacito by Latino artists Luis Fonsi and Daddy Yankee, both from Puerto Rico. The song's catchy rhythm has made it the most-streamed in history and earned it the number one spot on Billboard's Hot 100. With over 3 billion views on YouTube, it is also the most viewed video in the history of YouTube. That's especially impressive given that the song is in Spanish and a cultural crossover. However, it is now an international hit that exists in many languages. The song's mention of Puerto Rico plus scenes in the video have generated a lot of interest in travel to the island. People want to see "how we do it down in Puerto Rico" (a phrase from the song, translated into English). Travel-booking websites have seen an increase in search related to Puerto Rico, and increased tourism would certainly help this U.S. territory a bit with its economic difficulties. To say that Spain has wonderful food is an understatement. One example is the great fish and seafood found in the coastal regions, such as the Santander market shown in the photo. One summer delicacy enjoyed in northern Spain is grilled tuna. 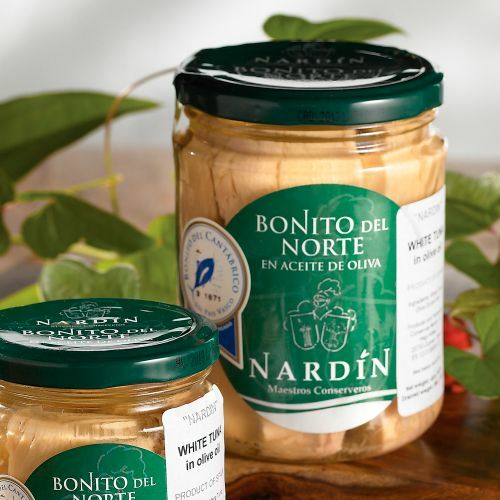 We're talking about the bonito tuna (Bonito del Norte), a small tuna that migrates every summer from the Atlantic to the Cantabrian Sea along the northern coast of Spain. Spanish fishing boats catch the tuna by hand with fishing poles and then return to port within a few hours, so the fish is very fresh and can be found the same day in fish markets and local restaurants. The meat of bonito is white and has a smoother texture than other tuna, and an exquisite taste. There's nothing like enjoying grilled bonito on a summer evening with outside seating at a local restaurant. Bonito is also packed in olive oil and sold in cans and jars. It retains its flavor well and is a top-quality product. Odds are you haven't heard of this tea, although it is as popular in parts of South America as coffee is in the U.S. It is made from the yerba mate plant, a shrub in the holly family that is commonly grown in plantations in northern Argentina, Paraguay, Uruguay and southern Brazil. Originally consumed by the indigenous Guaraní, mate consumption spread with European colonization. The drink is typically prepared by filling a vessel about three quarters full of the ground, dried leaves of yerba, to which hot water is added. Some might take offense at this brief description, as there are many intricacies to preparing a good mate, as well as to the ceremony of sharing it. Mate was traditionally consumed from a container made from a hollow gourd. It still is today although vessels made from wood, plastic or other materials are now common. The infusion is sipped through a bombilla, which is essentially a metal straw with a filter tip. Sharing mate is indeed a social ceremony in which the brewer (cebador) prepares the tea and passes it to a friend, who in turn sips the mate and returns it to the brewer, who refills it and passes it to the next person. Some may find this brew to be rather strong, although it can also be purchased in tea bags (known as mate cocido), for a much milder tea. Here at Spanish in Waterbury Center we often have mate cocido as one of the teas we provide for our students. Drinking mate is widely considered to have a number of health benefits. The site fitday.com discusses six: 1) Rich in Antioxidants, 2) Enhances Your Ability to Focus, 3) Enhances Physical Endurance, 4) Aids Digestion, 5) Helps You Control Your Weight and 6) Supports Cardiovascular Health. Like coffee, mate contains caffeine and so has a pick-me-up effect. It is known to reduce feelings of hunger and believed to boost the immune system and have anti-cancer properties. Click the YouTube play button below to see a video about yerba mate. Can mate make you happier? The website sanjuan8.com includes an article (in Spanish) on this topic. Yerba mate and drinks made from it can be found in health and natural food stores. Put it on your shopping list. 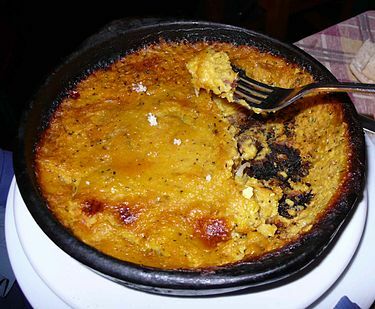 Some consider Pastel de Choclo, or corn pie, to be Chile's national dish. While students learn that corn in Spanish is maiz, the word choclo means 'ear of corn' and comes from the Quechua word choccllo. In Mexico, it's called elote, from the Nahuatil word elotl. There are many different variations of this dish; often it includes beef or chicken along with raisins, olives, onions and pieces of hardboiled egg. Unlike Shepherd's pie, the corn in Pastel de Choclo is grated or otherwise processed until smooth. The ingredients are layered in the dish, with the corn filling on top. It is traditionally served in a shallow, round pottery bowl. If you can't travel right away to South America to try Pastel de Choclo, try making your own. Here are a couple of recipes. So when you're at the supermarket (supermercado) in the U.S. and you pick up just about any food product, somewhere on the package you'll find the "Nutritional Facts" box. There's a lot of information there but it's hardly useful unless you know quite a bit about diet and nutrition. 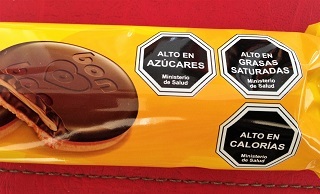 In contrast, take a look at this photo from a package of cookies (galletas) in Chile. Food packages in Chile have these alerts (avisos) when a product is high in sugar, saturated fats, sodium or calories. This way, you know right away and then it's your decision, but an informed one. Chile's labeling law was aimed at its obesity related health problems, associated with unhealthy diets. Chile however does not have a GMO labeling law. Translated, the labels say "high in sugars," "high in saturated fats," and "high in calories." Costa Rica is one of the most popular Latin American places to visit and for good reason. This relatively small country has everything from mountains and active volcanos to beaches, a varied climate and an amazing diversity of wildlife. 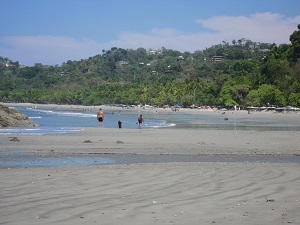 There is something to do for all tastes, as you can easily discover from the official tourism website www.visitcostarica.com. 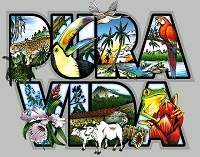 What’s more, you’ll find friendly people who live by the country’s hallmark phrase pura vida. Spanish for "pure life," pura vida is really a lifestyle, one of enjoying life to its fullest, appreciating the good things, being carefree and optimistic. The phrase is used frequently in conversation; what better way to keep "walking the talk!" Learn to say it and live it the way the Ticos (Costa Ricans) do. You may be interested in reading more at the website of a Boston couple who quit their jobs, packed up and moved there. You’ll find some helpful info for planning your visit. Costa Rica is popular, so be sure to plan ahead for the best selection of flights and hotels. A number of our students love Costa Rica, and our own vacation there was wonderful. Our only regret was not being able to stay longer and see more of this beautiful country! Every year on May 5, we ask our students about Cinco de Mayo. Do you know the significance of this day? Here's a short history. Cinco de Mayo of course means "May 5th" in Spanish and commemorates the victory of the Mexican army, lead by General Ignacio Zaragoza, over much more numerous and better equipped French troops, in the Battle of Puebla, 1862. Given what the Mexican forces were up against, this was a great victory and a unifying source of pride during difficult times. 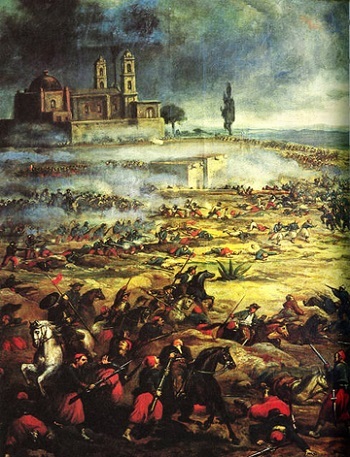 Mexican president Benito Juárez then declared that May 5 would be a national holiday to commemorate the battle. This victory was however short-lived as France came back with greater forces to conquer Mexico the following March, finally leaving five years later. If Mexico had not won the Battle of Puebla, France may have helped the Confederacy during the U.S. Civil War and affected the outcome. Today, Cinco de Mayo is a regional holiday in Mexico. It is celebrated to a larger extent in parts of the U.S. where there are significant populations of Mexican heritage. Festivities often include Mexican food, music, folk dancing, and parades. Chipá are cheese bread snacks, about the size of a golf ball. If you haven't tried them, well, you should. Enjoy them for breakfast or as an afternoon snack. They are best eaten right after being made, and no one eats just one. Chipá were originally prepared many years ago by the Guarani, an indigenous people who live in Paraguay and parts of Uruguay, northern Argentina, southern Brazil and Bolivia. The word chipa comes from the Guarani language. The Guarani made chipá with tapioca (a starch flour from the cassava root; mandioca in Spanish) and water. Recipes vary today but chipá is typically made with tapioca starch and cheese....we use parmesan and lots of it. 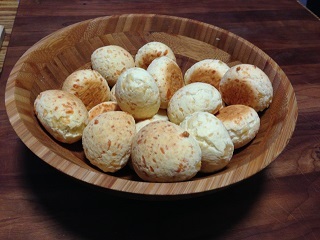 Since tapioca is not a grain, chipá are gluten-free. 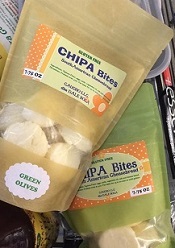 You can find chipá for sale at the Healthy Living Market in South Burlington; they are sold frozen, ready to bake and eat fresh (see photo at right). 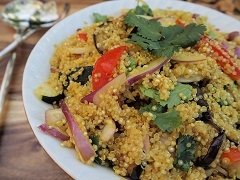 If you would like to try making your own, recipes can be found online. Click here for one. That’s the name sometimes given to Pimientos de Padrón, a small pepper from Spain. These peppers have a delicious and unique flavor, although 1 in 20 or so is quite spicy – hence the nickname. This characteristic adds a bit of excitement to enjoying them, and you may want to keep some bread handy as a fire extinguisher, just in case. The pepper was brought to Spain in the 18th century from South America and was cultivated by Franciscans at a monastery near the town of Padrón in Galicia, Spain. They can now be found in parts of the US, and you can also grow your own by purchasing the seeds, such as from Johnny's Selected Seeds. They are picked while small (1-1.5 inches in length or so), fried or sautéed whole in oil, and then served sprinkled with coarse salt. Better yet, travel to Spain during the summer and enjoy the real thing as an appetizer or at tapas restaurants. As they say in Spain, "Unos pican y otros no." July 13, 2014 marks 60 years since the passing of Frida Kahlo, the Mexican artista famous for her painfully personal self-portraits. She was born in Coyocoán, Mexico City in 1907. 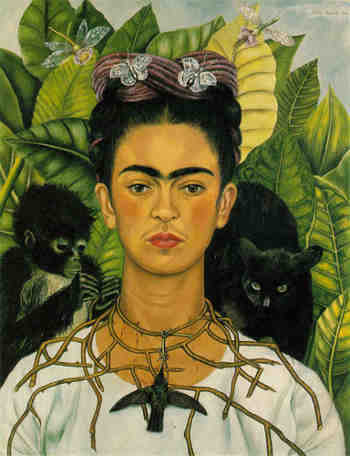 As an adult, Frida lived an active and controversial life as a painter, political activist and feminist. This is hard to imagine, given the obstacles she had to overcome. She contracted polio at age 6, and then at age 18 she was involved in a bus-trolley car collision that broke her spinal column (along with other injuries). She spent considerable time either in the hospital or bedridden, suffering considerable pain for the rest of her life. She took up painting to occupy her time, painting from her own experiences. Her work included many self-portraits and images that captured the pain she endured during her life, many of which are also painful to view. She eventually regained her ability to walk. In 1929 she married Mexican painter Diego Rivera, who encouraged her artwork, although their relationship later became very tumultuous. After suffering deteriorating health, Frida died at age 47, possibly from suicide. Shortly before her death, she wrote in her diary, "I hope the exit is joyful and I hope never to return." The award-winning 2002 film Frida tells the story of her life, with Salma Hayak starring as the artist. If you travel to Colombia, you will almost certainly enjoy eating arepas. The arepa, a round flatbread made of corn flour, is a plato tipico (typical dish) of Colombia and Venezuela. 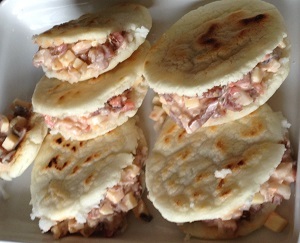 Arepas come in many different styles, varying from plain, to cheese mixed into the dough, arepa or those that are split in half and stuffed with various fillings (as in the photo) to form a sandwich of sorts. Common fillings include meat, cheese, and vegetables. One of our Colombian friends made arepas for us, using a filling of tomatoes, onions, mayonnaise and tomato sauce. A hearty Colombian breakfast may include fruit and an arepa along with some good Colombian coffee, but they’re good any time. Small local markets and street vendors are a part of everyday life in Latin America. 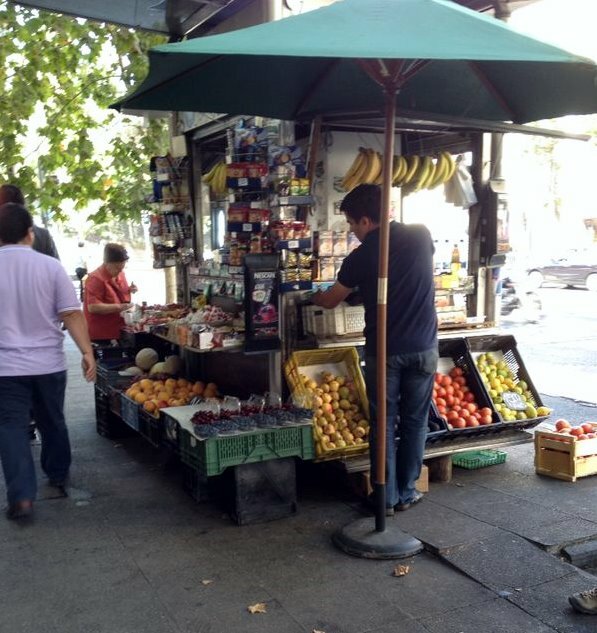 We especially like the fruit stands. Everything is so fresh and you are greeted by a wonderful, fruity aroma as you look over the neatly arranged fruits. But the real treat is the unbeatable taste, which you may find to be surprisingly different from U.S. supermarket fruit. Remember, what is exotic, tropical or just unavailable in the U.S. may be local to the area you are visiting. And you’re likely to enjoy fruits you’ve never seen before. Nothing beats a refreshing smoothie (in Spanish: batido or licuado) made from fresh local fruit, so be sure to keep an eye out for the local smoothie shop. You may also find street vendors selling various fruit snacks. 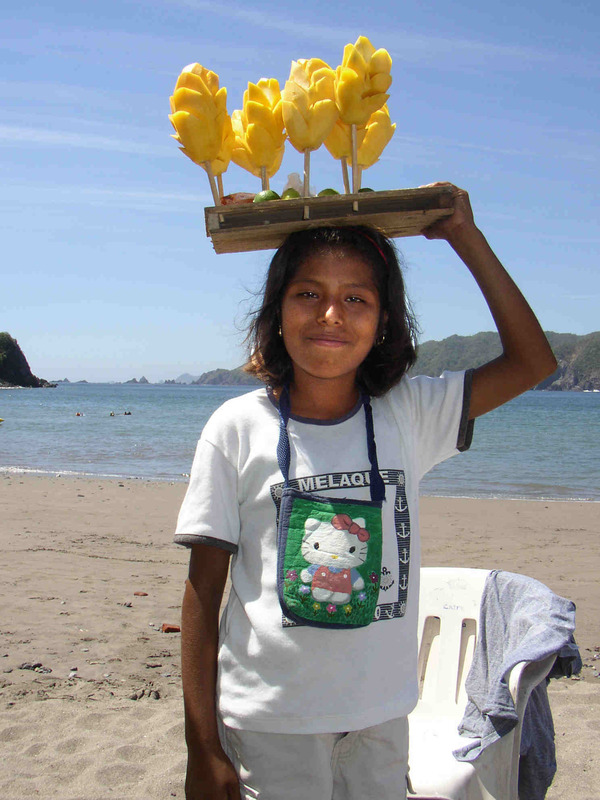 In some parts of Mexico, vendors walk the beaches selling ready-to-eat mangoes on a stick. You can add a bit of lime juice and chili powder if you like. So if you are traveling in Central or South America, be sure to enjoy the fruit! Founded in 1883 in Chile, Concha y Toro is one of the most important wineries in the world. Their oldest cellars and vineyards are located in Pirque in the Maipo Valley, about an hour from Santiago. One of their well-known brands is named Casillero del Diablo, which has a legend behind it. More than 100 years ago Don Melchor of Concha y Toro reserved for himself a selection of his best wines. However, he later noticed that some of the bottles were missing. To keep strangers away from his private reserve, he spread the rumor that the Devil lived there. Hence the name, meaning the Devil's Cellar. The photo shows a larger part of the cellar adjacent to the where the private reserve was historically held. If you visit Chile, you can tour the winery and cellars for yourself…if you dare. If you enjoy Chardonnay, you owe it to yourself to try Torrontés. 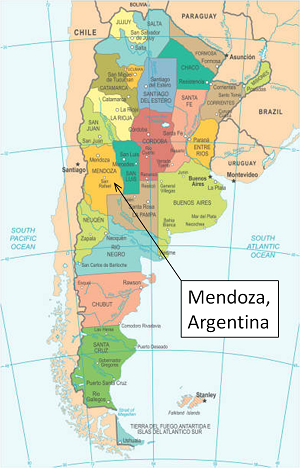 Argentina’s wine culture began in the 16th century when the Spanish explored and settled South America, bringing with them the vines of their favorite wine grape varieties. The best known wine from Argentina is Malbec, a flavorful red wine. Argentina’s other signature wine is Torrontés, a refreshing, aromatic white wine considered to be a wholly Argentine variety because it is produced almost nowhere else. Shown in the photo are examples of each. Torrontés deservingly gets such great reviews that we’re not sure why it hasn’t yet become more popular. Have you heard of it? The origin of Torrontés is uncertain, and it is not the same as a Spanish wine from Galicia labeled with the same name. 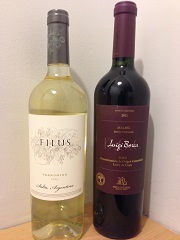 It is grown in some of the highest vineyards in the world in the Salta region of Argentina. It makes an excellent start to a meal and pairs well with delicate flavors such as fish and other seafood, but also with spicier dishes including Thai or Chinese. Step up from Chardonnay and give it a try. 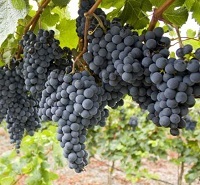 Malbec is a red grape variety that originated in France and was introduced to Argentina in 1868. Since that time, production in France has decreased in favor of other varieties, but increased substantially in Argentina. Three quarters of all Malbec is produced in Argentina, and it is considered to be the signature Argentine wine. Perhaps the best Malbec comes from Mendoza's high altitude regions, which are particularly well suited for bringing out the best in this variety. 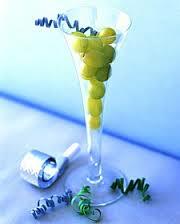 The variety is grown in a number of other countries, but to a much lesser extent and often for use in blended wines. Argentine Malbec is a full-bodied wine with flavors of plum and black cherry with gentle notes of cocoa and vanilla. It pairs well with strong flavored foods such as red meat, dark meat poultry, roasted pork, mushroom, roasted red pepper, potato, pizza, pungent cheeses and various spicy dishes (think sage, rosemary, cumin, pepper). In Argentina, it is commonly paired with grilled meats. Yum. If you enjoy wine and haven't tried Malbec, it's time you did. Carmenere is a dark-skinned red grape variety originally from the vineyards of Bordeaux, France. It disappeared from European vineyards in the mid-1800s and was believed lost, only to reappear among Chile’s Merlot vines a hundred years later. In the mid-18th Century, the aphid-like phylloxera arrived in Europe from North America. This sap-sucking insect feeds on the roots of the plant, and Carmenere vines are particularly susceptible. 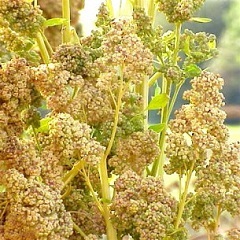 As a result, the variety was abandoned in Europe. 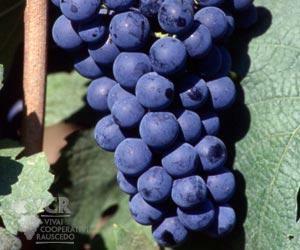 However, prior to the arrival of phylloxera, Chilean vignerons had taken cuttings from vineyards in the Bordeaux region. These stocks were believed at the time to be Merlot, and it was not until 1994 when DNA research confirmed that the Carmenere variety also existed in Chile. Chile then began making wine with 100% Carmenere, and the variety has since become Chile's signature wine. Historic and modern, traditional local dishes to cutting edge creative cuisine, appealing small shops to modern malls: Santiago has a lot to offer. Chile's capital is more than a vibrant city; seashore, mountains, and vineyards are all easily accessible as day trips. Shown in the photo is Valle Nevado, a ski resort in the winter. During the summer a trip up to the Andes can include mountain biking, horseback riding, trekking, rock climbing and more. Or relax and enjoy the great views, a chairlift ride and a mountain lunch on the deck. Chances are that you'll also see the Andean condor, Chile’s national bird. Chile is famous for its wines, and there are many options for vineyard tours. And don't miss the local arts and crafts in the many small shops at the Pueblo Los Dominicos. While there, try the pastel de choclo at one of the restaurant's comfy outdoor tables. This casserole made with corn is considered by some to be Chile's national dish. 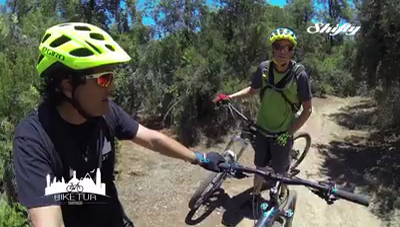 Ciclismo de Montaña: Since Santiago has the Andes mountains close at hand as well as some other hills (cerros) even closer, it should come as no surprise that there are some great mountain biking oppotunities. You can find guides who speak English, although they are happy to speak Spanish with you. Click the photo at left to watch the video of one of our advanced students being interviewed by his Chileno guide. Argentina is well known for its grilled meat, often served as part of an asado or a BBQ cookout/party. If you enjoy grilling, you owe it to yourself to try the flavor of Argentina with chimichurri sauce. 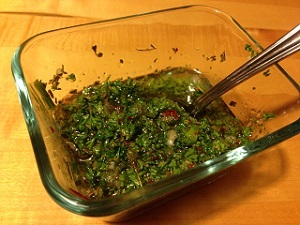 Chimichurri is an uncooked, green sauce used on grilled meats and fish. And it’s so good that many also enjoy it on a piece of crusty bread. The main ingredients are parsley, garlic, olive oil, and vinegar, with the intensity of its flavor coming mostly from the fresh garlic and parsley. It’s easy to make and shouts FLAVOR! While you can find chimichurri sauce in bottles, it is way better when made with fresh ingredients. Go FRESH! Chimichurri can be used as a marinade or applied to meat during grilling, but be sure to have some for use at the table as well (chances are that you’ll want to add more). Chimichurri is great with grilled beef, pork, and sausage. You should try it with Choripán - a sandwich made with sausage that is popular in Argentina, Bolivia, Chile, Guatemala, Peru, Puerto Rico, Uruguay and Venezuela. Choripán is a blend of the words chorizo and pan — sausage and bread — but that’s not all there is to it. Chimichurri is what makes the sandwich famous. While typically made with Argentine chorizo, you can use most any sausage. 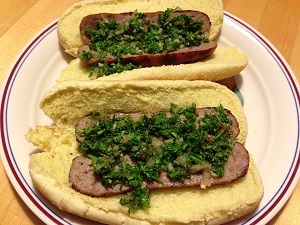 Don’t use a strongly seasoned sausage as the chimichurri will give you more than enough flavor. Use a good piece of crusty bread such as a French baguette. Grill the sausage and then butterfly it by slicing lengthwise. If you can, also toast the roll a bit on the grill. Place the sausage in the roll, add a liberal amount of chimichurri and enjoy! And don’t forget your favorite beverage, perhaps a microbrew or an Argentine Malbec. How are Christmas, New Year's and Three Kings Day celebrated in Hispanic culture? There are many unique customs that vary by country and household, but you will always find three things: delicious food, celebratory music and festive gatherings of family and friends. Festivities often begin in mid-December and continue until January 6. 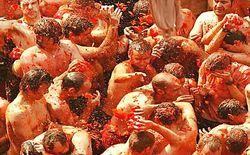 At the risk of over-generalizing, we've summarized the traditions below and included related Spanish vocabulary. Before Christmas: As is the case in most cultures, there are a number of celebrations leading up to Christmas. It is common to see a nativity scene or manger (el pesebre or el nacimiento) and some are quite elaborate. Instead of Santa Claus, Latino children will write letters to baby Jesus (la carta al niño Dios). Christmas carols (los villancicos de Navidad) often include songs that have been passed down from generation to generation. Las Posadas, a re-enactment of Mary and Joseph’s journey from Nazareth to Bethlehem and their search of shelter, are popular in Mexico (see also Celebrating Las Posadas). In Puerto Rico there are parrandas, in which people go house to house, singing Christmas songs and playing traditional instruments. 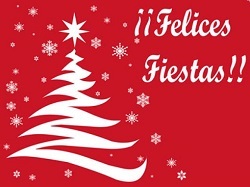 Christmas Eve & Christmas: Of course, "Merry Christmas" in Spanish is ¡Feliz Navidad! Christmas eve (Nochebuena) is celebrated rather than Christmas Day. It includes a special dinner of traditional foods (la cena de Nochebuena) with family and close friends. For Catholics, Nochebuena includes a Midnight mass (Misa del Gallo). Gifts are also usually exchanged on Nochebuena. As you can imagine, this is not a night for going to bed early! New Year's Eve: Nochebuena is usually spent at home with family, but New Year's Eve (Nochevieja) is often celebrated with friends and by going out (see also Hispanic New Year's Eve Traditions). Fireworks are widely held, and Valparaíso, Chile has the biggest display in South America. 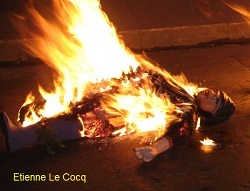 People in many Latin American countries make life-sized Año Viejo dolls (literally “Old Year”) that are burned to symbolically leave behind bad things from the old year. And make sure you are wearing the right color underwear to ring in the new year. Wearing yellow underwear will bring you financial success in the new year; red will bring you love and romance. The Spanish tradition of eating 12 grapes at the stroke of midnight is believed to bring good luck and prosperity in the year ahead. Christmas is celebrated in all the Hispanic countries, but there are many unique customs that vary by country. The custom of Las Posadas is celebrated in Central America, parts of the U.S. and in varied forms in other Latin American countries. The celebration takes place for nine nights from December 16 to Christmas Eve (La Noche Buena). Las Posadas are a re-enactment of Mary and Joseph’s journey from Nazareth to Bethlehem and their search of shelter – hence the word posada which is Spanish for lodging or shelter. Traditionally, a party is held each night in a different neighborhood home. Families and friends gather and walk in a procession as travelers or pilgrims (peregrinos). Children are often dressed as shepherds or angels and adults carry candles. They knock on the door of the host family's house and sing poetic songs (villancicos) asking for shelter. The "innkeepers" sing back and welcome everyone inside for a festive gathering with scrumptious food. 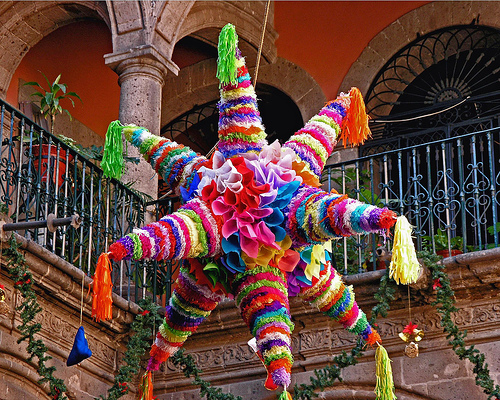 In Mexico, the party ends with a piñata in the shape of the Christmas star. 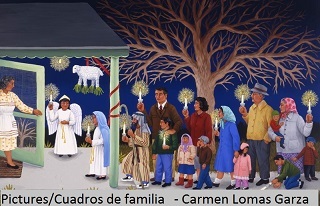 The last posada on December 24 is followed by midnight mass (Misa de Gallo). The HERDEZ® brand has recipes and advice for how you can host a traditional Mexican Posada or enjoy trying some of the traditional foods. No matter where you are from, New Year’s is always a time to reflect on the past year and plan for the next. In the Hispanic culture, there are quite a few traditions and superstitions for ringing in the New Year. These vary by country, but here are two of the most common. This Spanish tradition involves eating 12 grapes at the stroke of midnight on New Year’s Eve (Nochevieja), one for each chime (campanada) of the bell tower clock. This practice began in the 1890s but its true origin is uncertain. Some say it came from the French custom of eating grapes along with champagne while others believe that Spanish wine growers started the practice by sharing their grapes in a year of a bountiful harvest. It is believed that this tradition brings good luck and prosperity in the year ahead. The custom has become part of Spanish Christmas festivities, and the clock tower in Puerta del Sol, Madrid is watched on national TV, much like the ball dropping in Times Square. The custom is also followed in other Hispanic cultures, both in the U.S. and other countries. So don’t take any chances with your future; be sure to enjoy this fun tradition and have your grapes ready for the strike of 12! In Italy and much of Latin America, eating lentils as the first meal of the new year is thought to bring prosperity, perhaps due in part to their coin-like form. 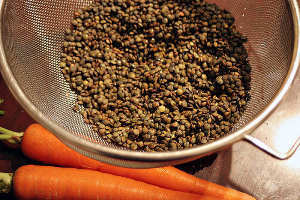 In some countries, it is customary to also place a handful of lentils in the center of the table or in places you'd like to see lots of money, such as in your purse or pocket. Does it work? Well, it doesn't hurt to try, especially if you're enjoying a nice lentil soup or stew! The color of the underwear you wear to ring in the new year may hold major consequences for your life in the year ahead. Is this just a superstition? Maybe it's best to not take any chances. The belief is that wearing yellow underwear you bring you financial success in the new year. Wearing red will bring you love and romance. The choice is yours. 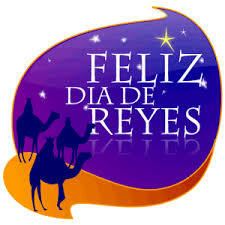 January 6th is Three Kings Day, or in Spanish, el Día de Reyes. In the Christian calendar, it is the 12th day after Christmas, known as the Epiphany and the day when the Magi (three kings or wise men) arrived to present gifts to the baby Jesus. It is celebrated throughout Latin America, Spain, and in Hispanic communities of the United States and is usually the day when children receive most of their holiday gifts. Children leave their shoes outside their doors, along with hay and water for the camels of the Three Kings. In the morning, the children find that the Kings had visited and that the camels had refreshed themselves with the hay and water. In addition, by their shoes the Magi have left them wrapped gifts. Each country celebrates el Día de Reyes somewhat differently, however most observe the custom of eating King's Bread (Roscón de Reyes or Rosca de Reyes), a circular sweet bread decorated with fruit that symbolize the precious gems that adorned the clothing of the Magi. Did you know that 2015 was the 400th anniversary of the completed publication of Miguel de Cervantes’ novel, Don Quixote? Perhaps you have heard of Don Quixote but wonder what the big deal is about a 400-year-old book. The fact is that Don Quixote is considered to be among the best works of fiction ever written. Indeed, in a poll of 100 of the world's top authors, it was voted it to be the best book of all time. Originally written in Spanish, the book has been translated into at least 50 languages. Many of the tales in the novel were no doubt inspired by the realities that Cervantes experienced during his life. This16th-century story is about an elderly, delusional Spanish nobleman who goes off to live a life of adventure as a chivalrous knight. While his adventures are simple, they have deeper meanings and explore the topics of liberty, justice, inequality, honor and how far one might go in pursuit of one's dreams. 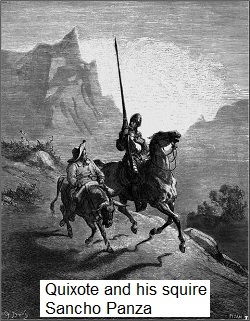 Cervantes takes the reader through a labyrinth of fantasy and reality, and we see that Quixote is at times wise and foolish, crazy and astute, a hero and a menace. Certainly he was overly idealistic and impractical, hence the meaning of the word "quixotic" which is based on the book. 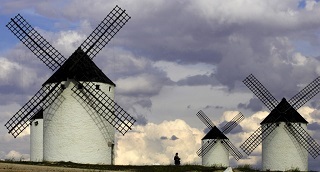 The idiom "tilting at windmills" comes from a famous chapter in Don Quixote in which our hero comes across a series of windmills which he imagines to be giants that must be vanquished. Perhaps we all face windmills at some point in our lives.